Nothing is more heartbreaking than being the pet parent of a cat or dog diagnosed with cancer – just ask Cienna’s parents. At the end of last year Cienna began having seizures and was diagnosed with a brain tumor. 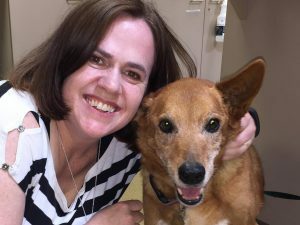 As her family looked for answers they learned about a human cancer treatment that would soon be available to pets with cancer – stereotactic radiosurgery or SRS. Cienna became the first pet patient to be treated with SRS through a PetCure Oncology partnership with Arizona Veterinary Oncology. You can read more about the start of Cienna’s cancer journey: Let’s Beat Some Cancer! That was over 2 months ago and today, after SRS treatment, Cienna is getting back to the important things in life – playing with her brother, a 63-pound Labrador Retriever. Fox News covered Cienna’s story, sharing information on SRS that could help other pet parents battling cancer in their four-legged children. If you have questions or need help with a cancer diagnosis in your pet, we are here to help.